I'm now hosting the Swirlydoos Card Challenge; this month, it's all about "The Men in Our Lives"! Curious? Why not stop by and see what it's all about? 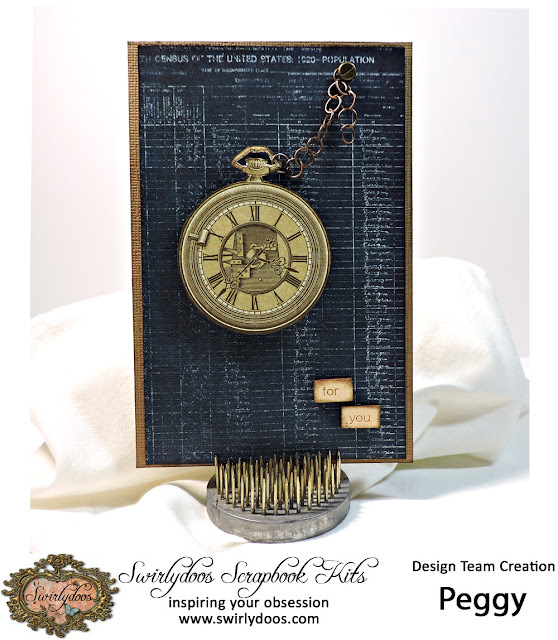 My first card features a few of the bits that were included in the "Sprocket" Embellishment Add-On, along with a few of the goodies that came in the Mediums Kit. I cut a piece from the Scrapberry's Records paper that would measure 1/4" more than the 7 Gypsies Junque Garage sticker and inked the edges. The sticker was adhered to a thin piece of chipboard (actually a cereal box) and glued to the base. The chippies were all coated with Crackle Paste and allowed to dry. Next, I covered them with the Inka Gold and allowed it to set overnight. 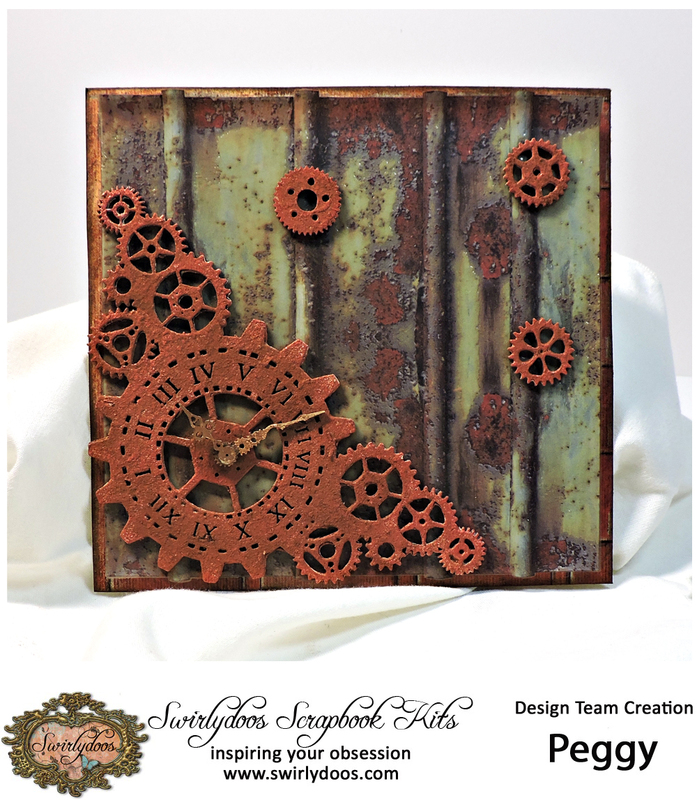 To complete the "rusted" look, I dusted them all with Artisan Powder and glued them to the card. The second card certainly fits the phrase "quick and easy". I cut a piece of cardstock to 4"x 6" and a piece of the Memos paper just a bit smaller. After inking all of the edges, I glued them together, with another piece of cereal box in between to give them a bit of dimension. The pocket watch was fussy cut from the Stopwatch sheet and inked. Next, I made a chain from some of the jump rings that came in the Project Kit. After using some foam tape to adhere the watch to the card, I attached the chain to the top with a brad from the Main Kit. A few wood bits from the May 2016 Embellishment Kit and I was done. Well, we can't forget the little guys in our lives, can we? 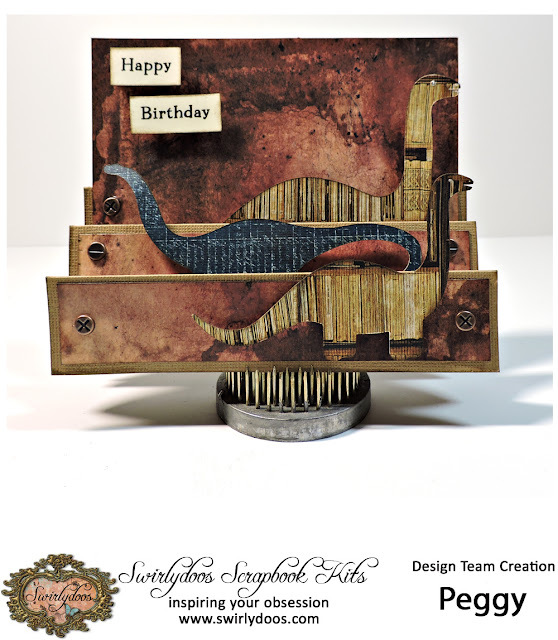 My grandsons' love of dinosaurs gave me this idea for an incredibly fun and easy card. I simply cut and scored a bit of cardstock and glued pieces of the packaging from the 7 Gypsies Junque Garage stickers that I had cut to size and inked. Before adhering these pieces, I poked some holes on the sides to fasten my brads. The dinosaurs were cut from scraps on my Cameo and attached with foam tape to make them "pop". To finish my card, I simply printed my sentiment on cream cardstock, cut and inked the words and again, gave them a "pop" with foam tape. Not only were these cards were so quick and easy to create; they were a great way to use up my scraps. I hope I've inspired you to make some cards for the men in YOUR life!